Virtually every house, restaurant or any other type of property have a set of gutters as well as downspouts built into the structure. The core purpose of such gutters is not only to effectively help drain away all of the rainwater but also to ensure that the walls, roofing and perhaps most important of all, the structure’s foundation remains dry. This is why gutter cleaning, especially with a pressure washer is extremely important for maintaining the continued structural integrity of the building. As a matter of fact, such clean and well-maintained gutters do not only extend the life of the roofing of the structure but at the same time, they make sure that there is no water damage whatsoever to your beloved home or the office building. When it comes to rainwater, gutters or any other external gutters can become a hazard if they are not maintained on a somewhat regular basis. This is because these gutters and downspouts have fundamentally been designed for the express purpose of channeling the drain and rainwater directly away from the foundation of the building along with the roof and walls of the structure. However, clogged and dirty gutters cannot perform this critically important function chiefly due to the fact that they may well be clogged with grit, fallen leaves, sand, and many other kinds of debris that tends to accumulate in the gutters over an extended period. Once that happens, the combined weight of the rainwater and the various other types of blockage inducing residue will become so heavy that the gutters will simply not be able to support the excess weight of the accumulated garbage, inevitably causing everything to collapse. Apart from the clearly visible scarring of the external structure that will surely decrease its curb value, it will also lead to massive flooding of the basement and by extension, the almost inevitable discoloration of the walls, not to mention a roof that will be constantly leaking. And should the broken gutter leakage extend to the basement and it too becomes flooded then there is an off chance that it can even potentially weaken the overall foundation of the whole structure, especially if the seepage is left completely unattended. Then there is the added danger of short circuits and their resultant fires as the water will start to seep into the electrical mains of the building. Apart from the issues stated above, there is also the very real problem of cracking walls and damage to the foundation pillars. This is because the water that has seeped inside, can easily freeze in subzero temperatures and thereby creating cracks, and at the same time, lead to the rotting of any wood roofing beams (should they be present in the building). From a purely visual standpoint, water strained walls certainly look and seem very tacky to say the least, and furthermore, they also tend to require fresh coats of paints at periodic intervals so that it appears presentable and thereby increase the overall curb value of the property. In order to unclog your gutters, it is imperative that you need to remove just about all foreign matter that doesn’t belong there. You should always try and remember that your gutters are perfectly open and therefore exposed to the elements as well. This means that anything and everything from leaves to pine needles to the really ominous plastic shopping bags may become wedged into the system and may even end up clogging the external downspout as well. Here, it is pertinent to understand that both “Pressure washing services” as well as “power washing services” are terms that are quite often used interchangeably. From a technical viewpoint, power washing involves the heating of the water first, for considerably deeper sanitation. However, hot water treatment is not always necessary and simple power washing of the gutters, with room temperature water can get the job done. If you live in a largely woody area with plenty of trees, then the odds are that your gutters will end up quickly filling up to the brim with dead leaves and twigs, especially in the fall season since that is the time when most trees shed their leaves. Under the circumstances, an ideal solution might be the installation of an ‘external drain and gutter filtration’ system that will easily allow the water to seep slowly into the gutters while blocking the ingress of any other sort of solid matter. You can easily include nets and various other filters that may be installed on top of the gutters so that the process of gutter cleaning becomes progressively easier. When should gutter cleaning take place? In the spring season when the trees generally drop the most debris and also produce sap, some of it starts clogging up your gutters. But that’s not all, as pollination takes place, seeds and other organic material builds up and manages to find its way into your gutters as well. In the late fall season, after the trees start shedding their leaves, they too become a reason behind the blockage. 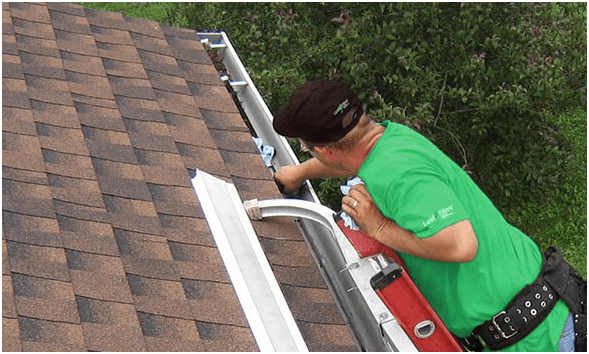 As a general rule, just about all downspouts and their inter-connecting joints tend to become clogged quite easily and therefore need a bit of highly effective gutter cleaning. This is to ensure that there are no barriers stopping the dirty water and is channeled quite smoothly into the ground. The best way to go about cleaning the connection joints is to perform the job with the help of power washing the gutters. Once that is done, the good people that you have hired for the job of gutter cleaning will then simply dig out the rubbish by hand (after making good and sure that they are wearing cut proof, wire coated gloves so that their hands are not injured due to needles, thorns, or jagged edges). The true blue professionals in this field will generally use a narrow base scooper that can easily go in quite deep and remove the rubbish from the inside of the downspout more easily in a safe manner. Once that has been done, it is important that hot water power washing is brought into the mix to get rid of any residual debris. If there are any blockages, the water will not gush out with the same pressure as it had gone in and meaning that you need a bit more gutter cleaning in order to ensure that they are perfectly free from any impediments. 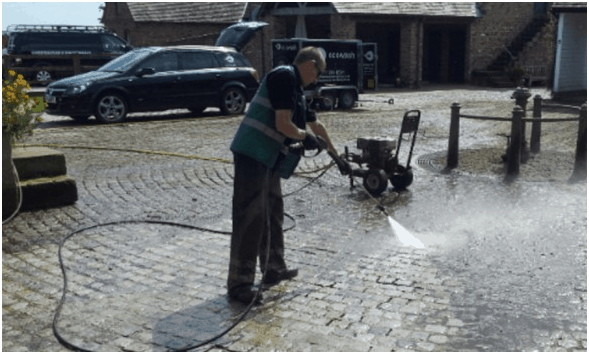 After this round of power washing, if the water gushes out of the gutter with the same speed and quantity as when it had gone in, the effort of the gutter cleaning experts have paid off and your external drainage system is now totally clear. Nevertheless, should you perceive that the water flow is not really consistent, it would be deemed prudent to continue the cleaning process, till such a time when the blockage has been completely removed, altogether. There are times when a considerable amount of prep work may be required beforehand. This may include scraping, soaking, or brushing, particularly if the work has to be conducted for a restaurant. In this case, the years of accumulated grease and grime will require sustained bouts of power washing, at least as far as the external areas are concerned. However, for just about all indoor jobs, really professional gutter cleaning and power washing service providers tend to take great care to protect all the internal and external surfaces that are not supposed to get wet. What exactly does gutter cleaning cost? Here, it is pertinent to note that any professional gutter cleaning and/or pressure cleaning service outfit will never upcharge a prospective property owner, based on how dirty the gutters of the structure may be. This is primarily due to the fact that they all go through the same thorough preparation as well as a cleaning process, irrespective of how dirty the gutter may be. Therefore they will see no reason for the property owner to pay more. Before cleaning your gutters, it is important that you go through certain aspects of the job before asking anyone to undertake the gutter cleaning process. If the gutters are loose and seem like they are falling apart, then no amount of cleaning may do any good and they will have to be replaced by newer and more sturdy structures, as soon as possible. Moreover, climbing ladders is not a job for everyone and whenever possible, a highly stable and adjustable ladder should be used. Lastly, under no circumstances should you attempt to handle this job alone, so make sure that you hire the real professionals, who have both the relevant training as well as the experience necessary to do the job in an effective manner. For major alterations in your gutters, such as the installation of a wire mesh net or repairs and outright replacement, it will always be prudent to hire the services of a professional gutter and external drainage cleaning outfit. This is because such professionals really know their job and can get the job done with the minimum amount of disruption in your day to day life. For more information regarding gutter cleaning and power washing, you can vist https://www.actionduct.com/gutter-cleaning/.